The largest printed project ever undertaken covering the Great War and, without question, the most important source of information on the war on The Western Front. The War Diaries of the Battalions who fought the Great War on The Western Front in printed book form. 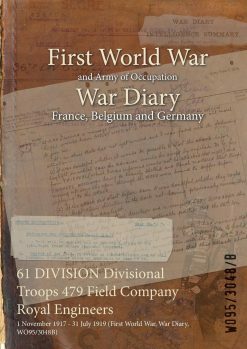 • Each diary page is chronologically indexed showing the location of the Battalion on a particular date. In addition, all operational orders, map titles, title pages and miscellaneous documents are indexed by date and title. See the Great War being fought day by day, by the men and units that hold an interest with your research. The War Diaries held under WO95 represent one of the most popular collections held at the National Archives, Kew, London and the opportunity to own a facsimile of an individual Diary is a huge boon for the serious WWI enthusiast. For researchers and family historians, the War Diaries contain a wealth of information of far greater interest than the army could ever have predicted. They provide unrivalled insight into daily events on the front line and are packed with fascinating detail. Our 20-plus years’ experience of publishing both rare and important military history titles has allowed us to undertake the largest printed project ever covering the Great War. We have published each War Diary in facsimile using the latest technology in commercial digital printing. The diaries are printed in full colour on an OCE CS3500 web colour press and perfect bound with laminated covers.